Emily Kubitskey received her Master of Education, M. 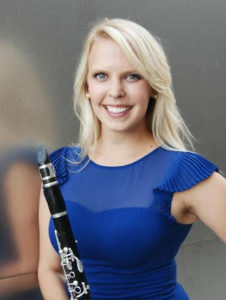 Ed., from the Peabody College of Education at Vanderbilt University and her Bachelor of Music in Clarinet and Organ Performance. During her time at Vanderbilt, Emily studied the effectiveness of non-profit music organizations for children. In Los Angeles, Emily’s passion and career is creating an environment in which all children, particularly those who are underserved, have the opportunity to thrive personally and socially through music. Currently, Emily is the Wind Ensemble Conductor and Assistant Conductor for the Los Angeles Philharmonic’s Signature El Sistema Program – YOLA. She works at the Heart of Los Angeles (HOLA) site, where, as a member of the inaugural staff, she helped build the wind program and curriculum from the ground up. Emily is also a Master Teacher for the Colburn Conservatory, where her current appointment includes conducting the top Bands at VAPA in Downtown LA, as well as teaching A.P. Music Theory. In addition to serving the needs of the El Sistema philosophy in Los Angeles, Emily travels internationally for her own company as an educational consultant, conductor, and acting artistic director for different programs. Through the last year, her most recent appointments have been in South Korea, Miami, London, and the San Francisco Area.